Coconut oil is one of the most convenient, versatile products to have in your house. Weather you’re eating it or making it into a hand cream, this stuff works. I invite you to read further and see how coconut oil can be a healthy addition to your diet, but also a lifesaver to have around the house. Up until the past decade, healthy and coconut oil were not used in the same sentence. This versatile oil was thought of as only a saturated fat no-no. How wrong we were! Now the buzz is all about how this healthy fat can be used in cooking, beauty products, cleaning products, and more. Coconut oil has hundreds of uses outside of just cooking. First off: how is this new superfood healthy to consume? Coconut oil is almost 90 percent saturated fat; however, that fat is mostly lauric acid. Lauric acid consists of medium-chain triglycerides (an MCT) which are metabolized easier than longer chains found in meat and dairy products. This metabolism boost means instant energy, and can actually help you lose weight. As a point of reference, Bruce Fife (C.N., N.D.), author of The Coconut Oil Miracle, recommends consuming 1-3 tablespoons of coconut oil daily. Coconut oil is a healthy fat, but is high in calories (about 117 a tablespoon) so consider your diet and lifestyle when deciding what the right amount is for you. So, now that you know how great coconut oil is for your diet, there are a few things to look for when buying your first jar. 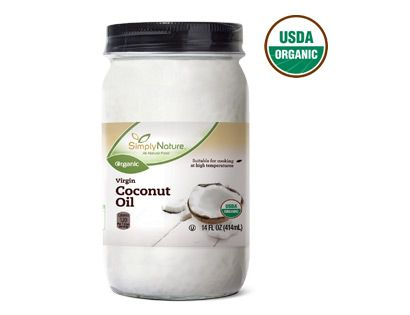 In my fridge, I have a jar of SimplyNature Organic Coconut Oil I grabbed from the grocery store for $4.99. Now the fun part: ways to use coconut oil outside of just cooking! Unrefined – this means there hasn’t been any bleaching or stripping that would compromise the oil’s health benefits. Virgin (tip: unlike with olive oil, you’re not going to find a discernible difference between “virgin” and extra virgin”). Good price! There’s no reason to drop tons of dough on coconut oil anymore. It’s become such a frequently bought product that you can purchase a 14 oz jar for anywhere from $5-$10 depending on the brand and your area. My 14oz jar will last me all winter!